I want to send one lucky winner to a food cart pod with a great atmosphere and a good vibe. If you show up at the right time you will also hear some live music. The Cheese Plate PDX is one of my favorite food carts. I love the variety that they offer. So go with me, if you will, to Alberta and 23rd, to The Cheese Plate. The owners Nick and Carina are so sweet and they want nothing more than for you to have an great experience. They have these beautiful cheese plates with house made crackers. After you order they will bring the plate out to you and they will explain where every one of the Oregon cheeses came from and a little about them. Seriously, it’s like a fancy restaurant except better. If you are vegan, don’t worry, they have got you covered. You are outside where you can enjoy some great weather, live music and lots of great people watching. Maybe the weather isn’t quite so warm, then you might be lucky enough to sit around a warm fire. Did I mention there is also a beer cart in this pod. It’s like a match made in heaven. The lucky winner will win this Cheese Lovers Plate or the option to try some grilled cheese sandwiches as I am giving away a $12 gift certificate. While you are there check out the rest of the menu, they also serve up some pretty awesome mac n cheese too. Their menu changes with the seasons, so what I ate you might not be on your plate, but I promise you won’t be disappointed. You can follow them on Facebook and see their ever changing menu. I know many of my readers have discovered The Cheese Plate PDX and they love it as much as I do. I want to take just a minute and share with you how they are hoping to expand what they offer. They are currently running a Kickstarter Campaign in which they are trying to raise money to build a cheese shop on the front of their food cart. They also have local products that they use at their cart and will carry those products as well for you to take home. Leave a comment telling me how much you love The Cheese Plate or if you have never been let me know what your favorite cheese is and why. For an extra entry, after watching yours truly on the video, describe why this is my favorite food cart. This giveaway will end Wednesday, February 26 at NOON and I will announce the winner later in the day. This giveaway is now closed. Congrats to Mark. I have only had the opportunity to have a grilled cheese from pdx cheese plate at the Portland Summer Food Cart festival last summer. It was the best unique sandwich I have had! I’ve only had the opportunity to eat at The Cheese Plate a couple times (wish I lived closer to them so could stop by more often) and loved it every time! They have a creative menu that is fantastic…whether you looking for a great grilled cheese and soup or a wonderful cheese board, they’ve got it covered. And like Amy, I too love this place because they use local products and the the presentation on the cutting board is something you don’t find at a food cart. Never been to the cheese plate, but my fave cheese is super-aged Gouda! Thank you for the offer, I would love to visit the Cheese Plate! My favorite cheese is anything made by the Tillamook cheese factory! We love watching them work. Wow! I own The Cheese Plate and just came over here to see what people were saying. What fun! Amy, you are creating such a community of foodie-minded good hearts. Thanks for everything you all have to say. I’m as excited as you all to see who the winner is! I still have not been! I’m so embarrassed but I just have not had time. It’s on the list. My favorite cheeses are the stinky ones! Blue and Gorgonzola that type of thing. Rogue is especially amazing. I’ve simply got to double up on my post to answer both questions. 1) The first time that I went to the Cheese Plate, I had my heart set on trying a special grilled cheese sandwich I’d heard about. It turned out that it was a discontinued temporary menu item, but they customized a version that was as close as possible with the ingredients they had– and it turned out AMAZING. I appreciate the Cheese Plate’s ability to satisfy their customers’ taste buds regardless of circumstances beyond their control (did anyone else notice how much work they went to to stay open as much as possible during the crazy Portland winter storm?). 2) My favorite cheese I must also share because of my passion for it: pecorino romano. This cheese is so full of flavor that once you taste it, lasagna and Italian meatballs taste bland and naked without it. Try substituting literally any dish that you normally use parmesan for with pecorino romano– it will rock your world. I knew there was a reason I wrote this down the other day! I just tried it yesterday and it overtook my previous top choice — a dutch cheese: ~ Uniekaas Melkbus 125 Winter. 😛 Boy… is it ever so hard to pick a favorite when it comes to fromage. However that is what I’de go with. It’s a remarkable raw milk young Gouda — There is just something so captivating about it. Awesome giveaway BTY !! I have never been to the Cheese Plate PDX, but I’ve been dying to go there ever since I read about it here on this blog. I feel like I love cheese more than a human ought to. Whenever I go to nice grocery stores, I linger way too long in the interesting cheese sections. I tend to like the hard to semi hard intense flavor cheeses that I feel in the back of nose as I eat it. But I also really like a nice, bit of Gruyere melted on a bit of crostini. With a little bit of tart apple. Okay, now I’m drooling. Yummmmm…… We love cheese… Never been to this place but it sounds fabulous! My current favorite cheese is smoked Gouda. Yum. I would love a chance to go to the Cheese Plate. Still can’t believe we haven’t made it there yet. I pretty much love anything goat. I agree, I too love how it uses local products and the cutting board presentation, or any presentation for that matter, is rare to find from a food cart! My favorite cheese is Chaource! I’ve never been to the Cheese Plate but I’d love to! We went here last summer. It was great! Also awesome that they had gluten free options! 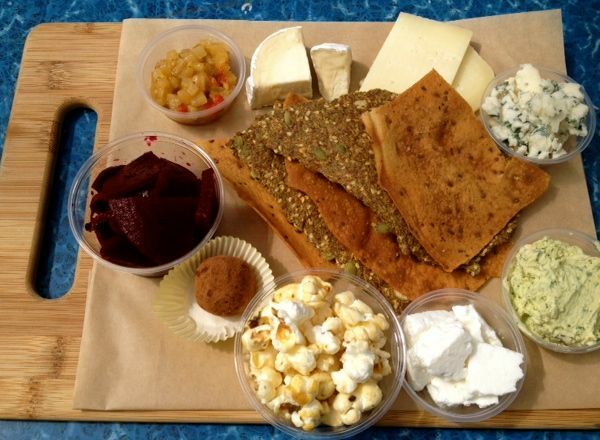 I’ve never visited the Cheese Plate…although now I think I really need to! But my favorite cheese: Gorgonzola when it’s on something or Gouda all by itself! I haven’t been there, but my favorite cheese (which I can not afford) is Mt. Tam by Cowgirl Creamery. Still can’t believe I haven’t made my way up there yet. Every time you post, it remind me how badly I would love to check this out! Thanks.